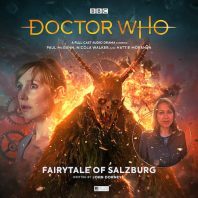 With the Doctor and most of the people of Seizburg condemned to Hell as the legend of the Krampus turns all too real, Liv and Helen find themselves in a race against time to find both the source of this chaos and the one man who can bring hope to this world of damnation in ‘Fairytale of Salzburg’ by John Dorney. Following on from the events of ‘Better Watch Out,’ ‘Fairytale of Salzburg portrays companions Liv and Helen at their most determined and proactive as they attempt to stay one step ahead of the imps rampaging the streets and to save as many individuals as they can. Neither is afraid to admit that they are both out of their element, but without the Doctor who can routinely make gold out of what appears to be nothing they realise that they and the TARDIS could very well be Salzburg’s last chance at redemption. Although the voices chosen for the imps are fairly stereotypical, the threat that these creatures pose is immense with no barrier safe from their destructive advances, and the sound design helps to create a palpable tension that fuels the anguish and near despondency of the few remaining souls trying to mount a resistance. With Maria still reeling from her father’s suicide he wrongly hoped would help his family’s fortune through an insurance payout and facing the guilt of her impassioned plea to make the Krampus real to seek revenge on the greedy Shafranek when offered one wish by a bystander on the street, Liv shows her empathetic and compassionate nature as she is ominously told she will soon need a wish of her own when Maria’s cannot be reversed and Helen seemingly abandons them all to their fate. As the horned beast stomps through the burning desolation of the city and innocent lives continue to be lost, the tale unfolds in three parts at various times and locales, even offering a brief respite by showing the Doctor and his companions first arriving and enjoying the sights from the view of the guest characters. Yet as the Doctor at a point in his personal future reassures a man watching the city burn that everyone will be okay and optimistically explains the importance of the individual person and the profound effect one can have on others and their actions, the more intriguing series of events centres around the brilliant Siân Phillips’s elderly pilgrim claiming to be a fallen angel who has an important story to tell to a bishop who has proven incredibly difficult to find. Raad Rawi makes an immediate impact as this humble individual who is dedicated to the lord and helping others, and though the bishop freely admits that this woman is asking him to accept an incredible amount on faith alone as he hears about demons and magical blue boxes, he remains open-minded and compassionate throughout and proves to have the fiercest determination and belief in love and goodwill when confronted with the embodiment of evil itself. ‘Fairytale of Salzburg’ refuses to follow the expected path to its resolution, but the manner in which this story brings the past, present, and future into the fold is remarkably satisfying and makes the most of its two brave companions as Helen proves willing to make the ultimate sacrifice to achieve her very long-standing journey to find the only hope history has ever provided. This is a story built upon despair that interjects sprinkles of hope at perfect intervals, and the very foundations of the legends of Christmas playing out on the streets of Salzburg creates an intensely personal and emotional resolution that perfectly encapsulates the true meaning of the season. Although the expected partial reversal of events is expected given the titular fairytale nature of the story, the groundwork for this is well-entwined within the confines of the story and makes perfect sense as loved ones reunite and even the most curmudgeonly man sees the error of his ways. This two-part story is a triumph in every regard, highlighting the implicit trust among this TARDIS team and developing the Christmastime Salburg setting to remarkable effect in a tense and well=paced affair that expertly balances spectacle and intimacy.